What Type of Weather Does an Occluded Front Bring With It? What Happens When a Cold Front Meets a Warm Front? What Types of Fronts Make Up a Thunderstorm? 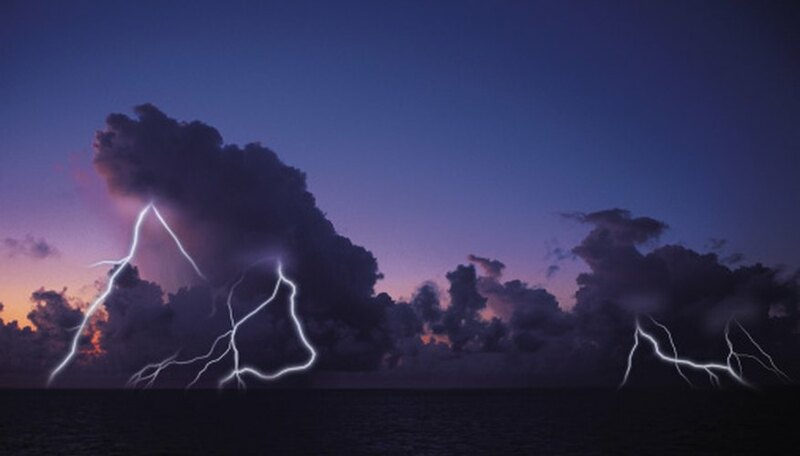 A thunderstorm is a storm that produces thunder and rain, on average lasting about 30 minutes and averaging about 15 miles in diameter. There are four types of weather fronts that cause thunderstorms: cold front, warm front, stationary front and occluded front. Thunderstorms can become extremely severe and can appear seemingly out of nowhere along a front line. Super cell thunderstorms are the storms typically associated with tornadoes. Cold fronts occur when warm air is pushed up into the atmosphere by colder air at the ground. These fronts tend to move faster than the other types of fronts and are associated with the most violent types of weather such as severe and super cell thunderstorms, although any type of front can produce these same storms. Cold fronts are easier to spot for meteorologists because they typically have a high pressure system to the north and west of them, and they tend to bring cooler temperatures behind the front line. After a cold front passes it is common to have clear skies and a dramatic change in wind direction on top of the cooler air associated with the front itself. Warm fronts occur when cool air is being pushed away from the surface by warmer air. These fronts tend to produce less violent storms and move much slower than cold fronts. Most rain associated with warm fronts is a light to moderate rain that can include fog. Warm fronts tend to precede a cold front and often sit to the northeast of a low pressure system. Behind a warm front, skies tend to be relatively clear but gradually will change. This is because a warm front is commonly followed by a cold front. A stationary front is a front that does not, or seemingly, doesn’t move. These occur when a front line gets stuck between two opposing front lines (e.g., a cold front gets sandwiched between two warm fronts). Weather along these fronts tends to more closely resemble warm fronts, making them most dangerous in the winter months when they can cause several days of continuous snowfall in one area. Occluded fronts occur when faster-moving cold fronts overtake slower-moving warm fronts. Usually an occluded front is a sign that the frontal line is about to break apart and dissipate. Weather behind the front line will be similar to that of a cold front and is where most of the severe weather could be present. Ahead of the front line weather would be similar to that of a warm front and tends to be milder. Anthony Petronzi began writing in 2002. He works for the government and covers sports for "In Play! Magazine" in Chicago. He has edited a book on poetry and art for Siena Heights University, where he earned a Bachelor of Arts in creative writing and journalism. What Happens When Air Pressure & Temperature Drop? Petronzi, Anthony. "What Types of Fronts Make Up a Thunderstorm?" Sciencing, https://sciencing.com/types-fronts-make-up-thunderstorm-8656770.html. 24 April 2017. Why Does it Rain When the Pressure Is Low?